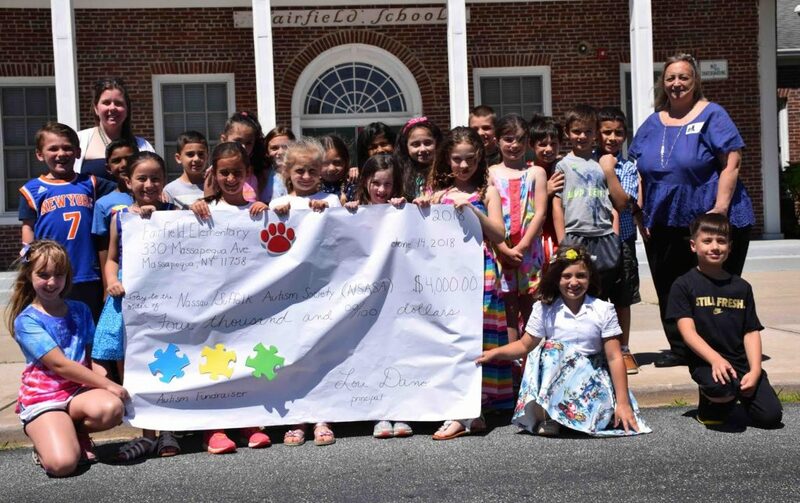 Fairfield Elementary School in the Massapequa School District recently donated $4,000 to the Nassau Suffolk Chapter of the Autism Society of America. The school raised $700 from the puzzle piece campaign in April, which is Autism Awareness Month. Families could make a donation and customize a paper puzzle piece to be hung in the school. The puzzle piece represents the mystery and complexity of Autism Spectrum Disorder. The donation was matched by second-grader teacher Jennifer Lidonnici’s family and also by a former Fairfield teacher. A staff fundraiser raised the rest. Executive Director Susan Reek visited the school on June 14 to accept the donation. Money will support a day at Fink’s Country Farm for approximately 150 children with autism and their families. Activities will include pony rides, an animal farm, bounce houses, pumpkin giveaways and more. Photo caption: Jennifer Lidonnici’s second-grade class at Fairfield Elementary School presented a donation to Susan Reek, right, executive director of the Nassau Suffolk Chapter of the Autism Society of America.